The latest Golf R, introduced for model year 2015, is the most powerful version of the Golf ever to be sold in this market. With 292 horsepower, it has 36 horsepower more than the previous version, which was sold as a 2012 and 2013 model. Despite the additional horsepower, the R model is fuel-efficient for a car with such performance, posting an EPA-estimated highway fuel economy rating of 31 mpg with the six-speed manual transmission. The Golf R continues to add value in 2017. The Golf R with DCC and Navigation comes standard with Adaptive Cruise Control (ACC), Forward Collision Warning and Autonomous Emergency Braking (Front Assist), Blind Spot Monitor with Rear Traffic Alert, Front and rear Park Distance Control (Park Pilot), Lane Departure Warning (Lane Assist), High Beam Control (Light Assist) and 19-inch “Pretoria” aluminum-alloy wheels. Volkswagen R GmbH has developed numerous unique exterior elements for the flagship Golf R. These include the bumpers, side skirts, rear diffuser, rear spoiler, and dual-exit chrome exhaust tips, Bi-Xenon headlights, and standard 18-inch “Cadiz” aluminum-alloy wheels. 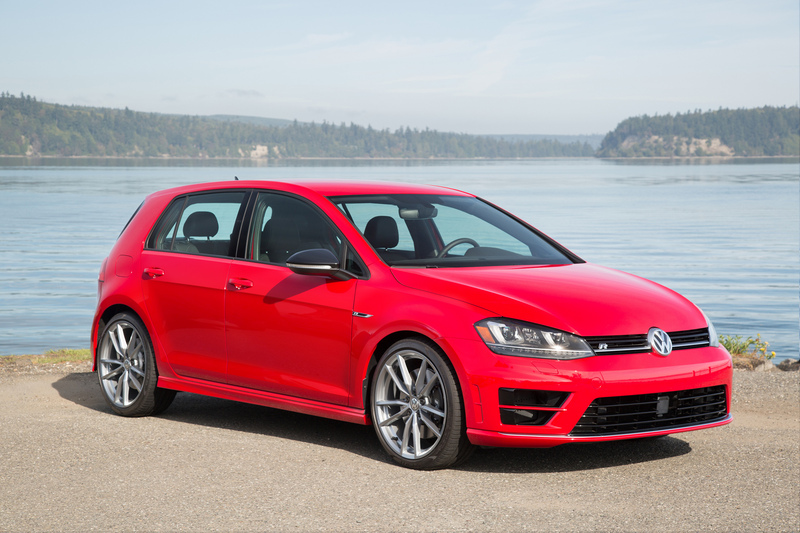 The Golf R is distinguished at the front by a bumper design with larger air inlets, a modified radiator grille that sports an “R” logo, and daytime running lights that are integrated into the Bi-Xenon headlight housings. The LED Daytime Running Lights form a distinctive dual “U” design beneath the headlights. From the side, the Golf R is characterized by 18-inch “Cadiz” or available 19-inch “Pretoria” aluminum-alloy wheels shod with 225/40 or 235/35 tires, black brake calipers with the “R” logo, body-color “R” style side skirts, “R” badges on the front fenders, and black painted door mirror caps. 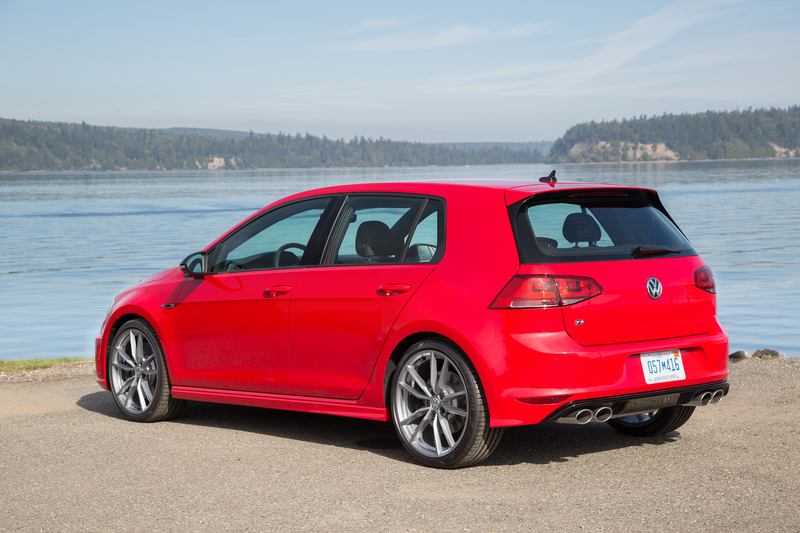 Rear details that define the Golf R include an “R” design diffuser, four chrome tailpipes, and an “R” logo on the hatch. 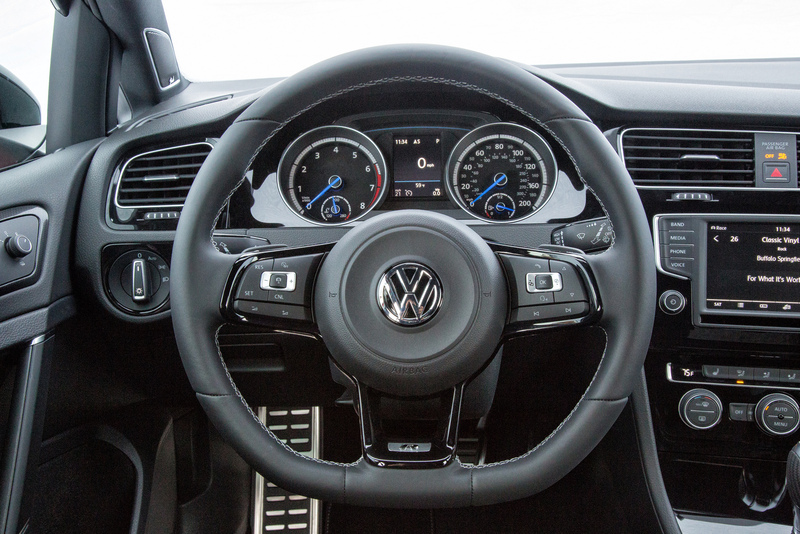 As in the three previous Golf R models, Volkswagen R GmbH has extensively upgraded the interior. 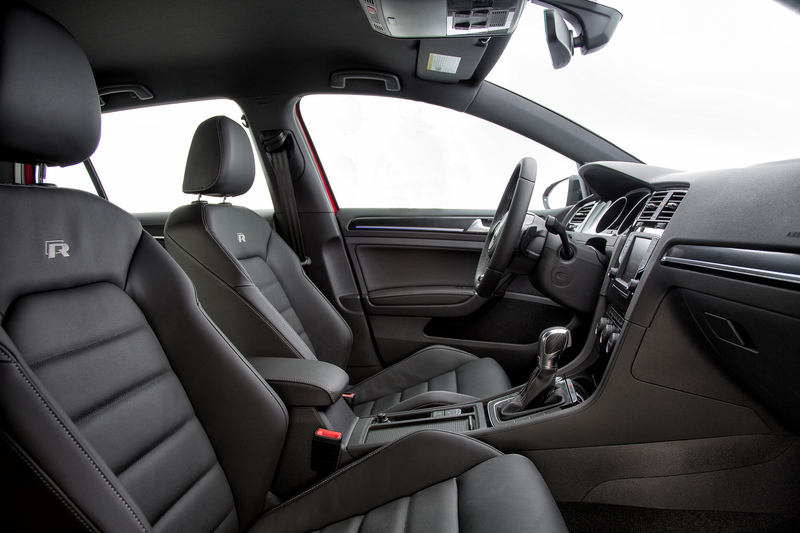 The most powerful Golf is equipped with front sport seats with 12-way power adjustment for the driver and leather seating surfaces integrated with “R” logo embroidering. A flat-bottom, leather wrapped sport steering wheel integrates a chrome “R” logo on its lower cross bar. The decorative inlays of the dashboard and door trim panels feature the “Carbon Touch” design; ambient lighting is also integrated in the door trim panels as standard. The doorsill kickplates, pedals, and foot support are designed with a stainless-steel look. The instruments and the touchscreen start menu are also customized. 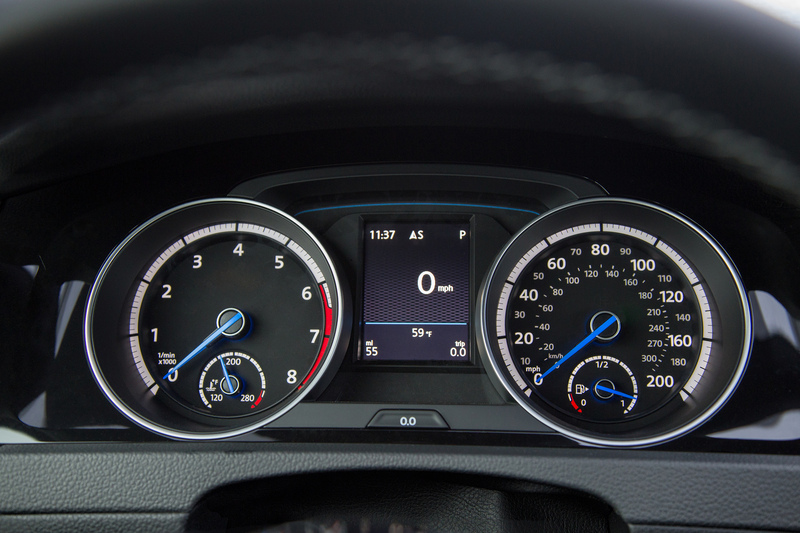 When the ignition is switched on, the illuminated light-blue tachometer and speedometer needles sweep once across the entire scale to their end pins. The instrument needles are also automatically illuminated as soon as the driver’s door is opened. The radio or navigation system touchscreen shows an animated “R” logo on startup. One of the most technologically advanced features of the Golf R comes in the form of its MIB II touchscreen infotainment system with USB and Volkswagen Car-Net® App-Connect, standard on all trims. This infotainment system offers one of the most comprehensive suites of connected vehicle services and features available in the automotive industry today. Features available through the VW Car-Net are divided into three key areas, App-Connect, Security & Service, and Guide & Inform. App-Connect. The Composition Media unit is standard on the base model. Featuring an 800×480 capacitive color touch display with proximity sensor, and a 6.5-inch screen, standard features include AUX-in, two SD card slots, and a USB multimedia interface with Apple iPhone® and iPod® compatibility, reverse camera display, and Bluetooth® technology with streaming audio, the ability to sync two compatible phones simultaneously and send and receive SMS text messages with compatible phones, App-Connect compatible smartphone integration, a JPEG viewer, SiriusXM® Satellite Radio, HD Radio and support for lossless audio file format (Free Lossless Audio Codec FLAC). The DCC and Navigation trim features the Discover Media unit, which captures the features available in the previous unit and adds 2.5D Navigation, one-shot voice destination entry, predicts possible destinations based on often used routes, and Destination Entry with Quick Search and Auto-complete, as well as a three-month trial of Car-Net Guide & Inform. Security & Service. With the Car-Net Security & Service suite, owners can access their VW remotely through vw.com/carnet as well as a smartphone app, and an in-car Car-Net button console, providing access to the features available from virtually anywhere your mobile device is connected to wireless internet. 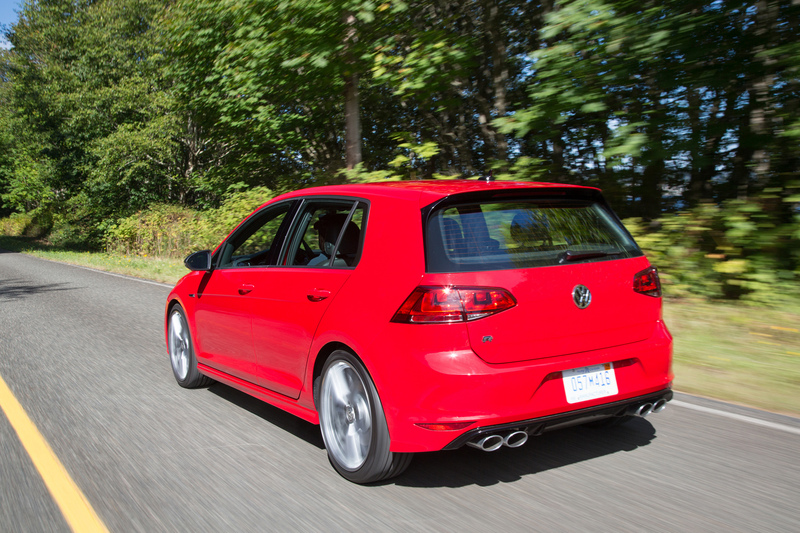 The Golf R has a more advanced version of the EA888 four-cylinder turbocharged and direct-injection TSI® 2.0-liter engine that’s fitted to the 2017 Golf GTI. The engineers boosted power to 292 hp, delivered at 5,500 rpm, thus creating one of the most powerful four-cylinder production engines in the world. Maximum torque has been increased to 280 pound-feet, available over a broad speed band from 1,800 to 5,500 rpm. 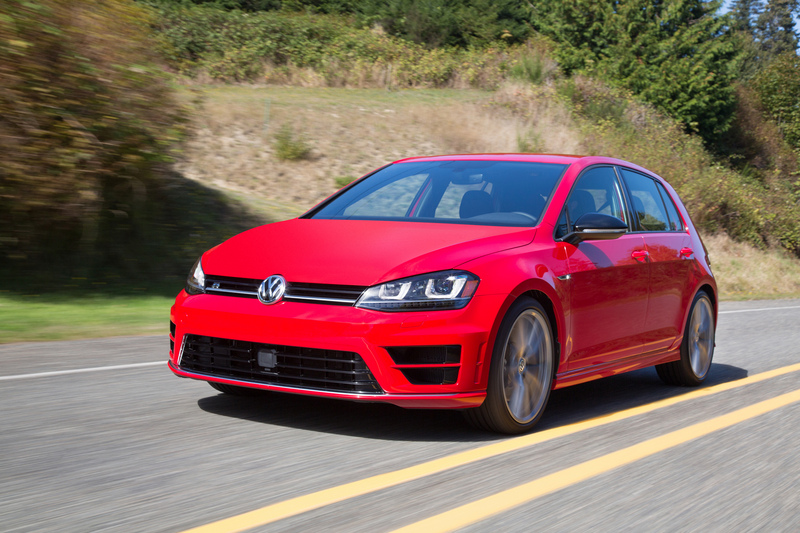 To attain this output, the Golf R model’s 1984-cc engine was subjected to a motorsports-style development program. The following components were modified or completely redesigned compared to the GTI engine: the cylinder head (together with exhaust valves, valve seats, and springs), pistons, high-pressure injection system, and turbocharger. The Golf R model’s EA888 series engine has innovative engineering solutions such as water-cooled exhaust gas channels running through the cylinder head to the turbocharger to help efficiently reduce full-load fuel consumption. 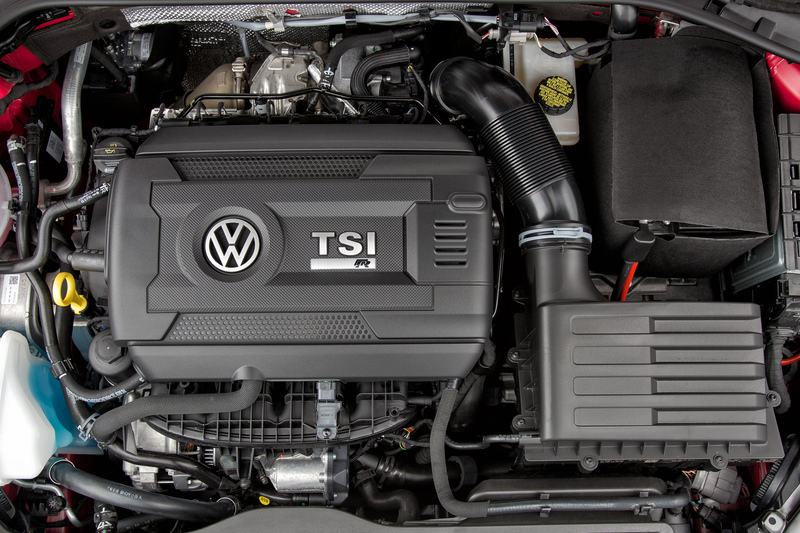 Thanks to its fully-electronic coolant control system, the Golf R TSI engine has more efficient thermal management with a reduced warm-up phase that help reduces frictional losses and fuel consumption. In addition, the TSI engine has variable valve timing on the intake and exhaust sides, as well as two-stage exhaust-valve lift. This helps enable optimal control of the charge exchange process for better performance and fuel economy. Equipped with a six-speed manual transmission, the Golf R will reach 60 mph from rest in 5.3 seconds, an improvement of 0.4 seconds over the old car; with the six-speed DSG® dual-clutch automatic transmission, the car completes the sprint in just 4.9 seconds. When equipped with the six-speed manual transmission, the Golf R achieves an EPA estimated fuel economy rating of 22 mpg in the city and 31 mpg on the highway. When equipped with the optional six-speed DSG dual-clutch automatic transmission, EPA estimated fuel economy ratings are 23 mpg in the city and 30 mpg on the highway. The latest-generation 4Motion system is activated before any wheelspin occurs, helping eliminate nearly all traction losses. The system achieves this by using an advanced control function based on specific driving conditions. When operating under a relatively low load or when coasting, the front wheels are driven and the rear wheels are decoupled, helping to save fuel. However, the rear wheels can be engaged in fractions of a second whenever necessary via the center coupling, which is activated by an electro-hydraulic oil pump. A control unit can continually calculate the ideal drive torque for the rear wheels and controls how much the multi-plate clutch should be closed by activating the oil pump. The oil pressure increases the contact pressure at the clutch plates in proportion to the torque desired at the rear axle. So, the amount of pressure applied to the clutch plates can be used to continuously vary the amount of torque going between the front and rear wheels, up to a maximum of 50 percent at the rear axle. In addition to the center coupling that acts longitudinally, electronic differential locks (EDS) that are a function of the electronic stability control system act laterally. The system briefly brakes a wheel that is slipping, enabling uninterrupted and stable transfer of drive power to the wheel on the opposite side. 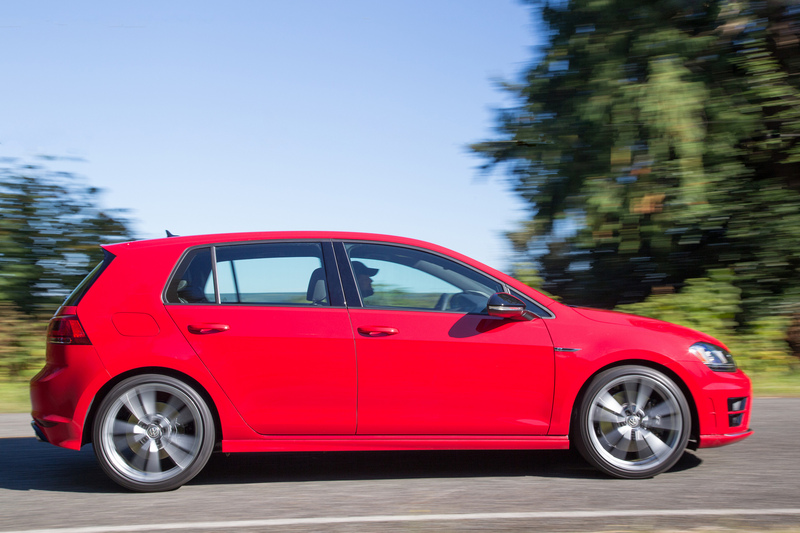 The Golf R features a sport suspension setup that is specifically tuned to the car. 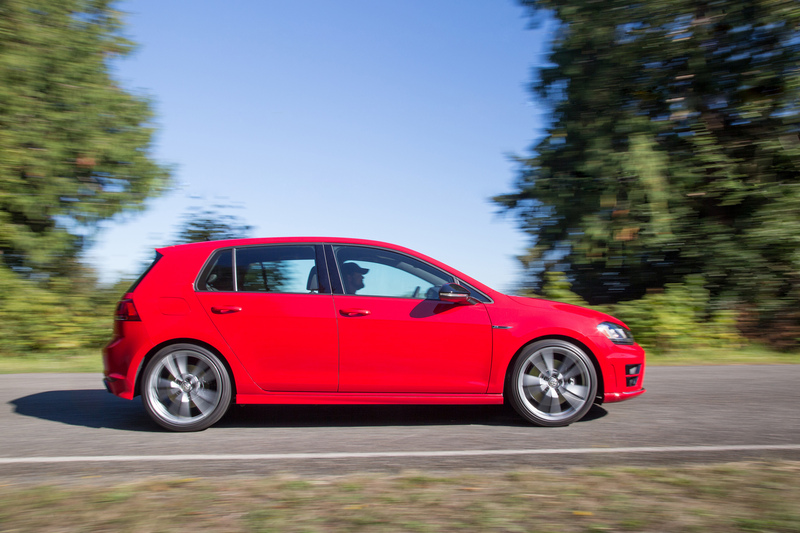 Compared to the base Golf, the ride height was dropped by 0.8 inches, which makes the Golf R even lower than the GTI, by an additional 0.2 inches. In the Golf R, the strut-type front suspension has a modified lower control arm and the multi-link rear suspension was enhanced with different tuning of the toe-link bearings. The engineers designed the running gear of the 2017 Golf R for maximum driving fun combined with extraordinary stability and good long-distance comfort. Compared to the previous model, steering response was improved thanks to the progressive variable ratio steering rack. In addition, maximum attainable cornering speeds were significantly increased and understeer all but eliminated. With the progressive electric power-assisted steering system, there are 2.1 turns of the wheel (380 degrees) from lock to lock, compared with 2.75 turns (500 degrees) for less powerful Golf models. The new steering operates with a progressive gear ratio, perceptibly reducing steering effort in maneuvering and parking. On country roads with lots of bends, the experience can be enhanced because the steering is more direct. 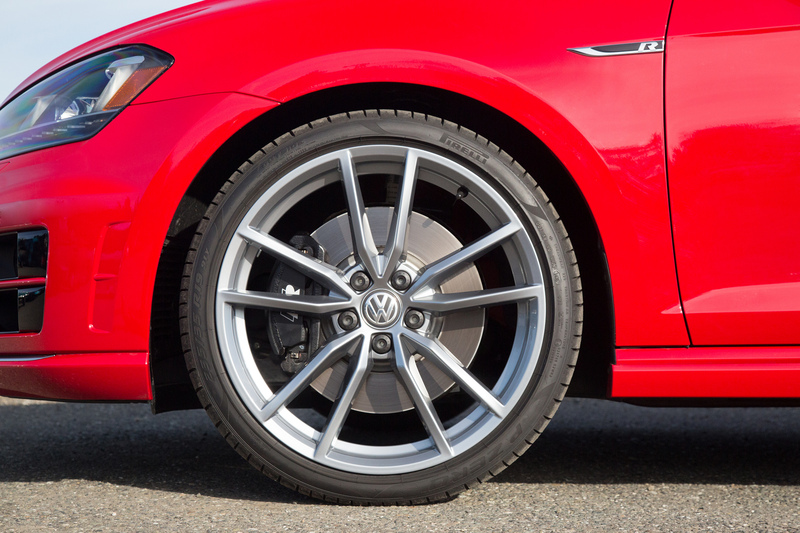 The Golf R has the uprated brakes from the GTI Performance Package model. At the front, the car has 13.4-inch diameter vented discs that are 1.2 inches thick, while the rear rotors are 12.2 by 0.9 inches. The black brake calipers have the R logo on them. Up front, the single pistons are 2.4 inches in diameter and are 1.7 inches at the back. In addition, the Golf R is equipped with the XDS® cross differential lock at the front and rear. The latest XDS+ version applies this functionality to a larger range of dynamic performance, helping make the vehicle more agile. 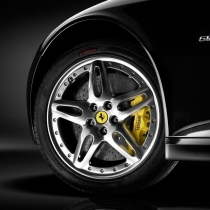 When the car is being driven at highway speeds, brake pressure is applied to the inside wheel to help restore optimal traction as soon as the electronics detect excessively light loads. The XDS+ system operates like a limited-slip differential and can help compensate for understeer during cornering. The Driving Mode Selection feature has three programs in the Golf R: “Normal”, “Individual”, and a “Race” mode that has been specially designed for the Golf R. In “Race” mode, which is designed for high-speed track driving, engine response and the shift points of the DSG transmission are configured to be even sportier. In the “Individual” driving profile, the driver can combine mode settings for various individual parameters. On the 2017 Golf R with DCC and Navigation, the Driving Mode Selection feature also encompasses electronic adjustment of the suspension characteristics. DCC® also adds a “Comfort” driving mode, which is selected and displayed alongside “Normal,” “Individual,” and “Race” via the center console touchscreen as part of the “Driving Profile Selector” functionality. In “Sport” mode, the dampers are stiffened for more agile handling; in “Race” mode the dampers are stiffer still, and in “Comfort” mode they are in their softest setting. The new Golf R is equipped with “ESC Sport” as standard. The system is activated by a two-stage switch on the center console. When the driver presses this switch, Electronic Stability Control (ESC) switches to the “ESC Sport” mode. In very fast driving on a race track, the ESC system has a higher threshold in this mode. When the ESC button is pressed for longer than three seconds, the system is fully deactivated for high-performance track driving, a feature that is available only on the Golf R.
To help protect occupants, the Golf R provides a combination of both passive and active safety systems. The Golf R has been engineered to meet or exceed all current crash regulations and features no fewer than six airbags as standard along with a number of electronic and mechanical safety systems, including standard Electronic Stability Control (ESC). A standard feature on the 2017 Golf R models is Volkswagen’s Automatic Post-Collision Braking System. This builds on the premise that a collision is rarely a single, instantaneous action, but rather a series of events that follow the initial impact—the most significant of which can cause additional collisions. The Automatic Post-Collision Braking System addresses this by applying the brakes when a primary collision is detected by the airbag sensors, thus helping reduce residual kinetic energy and, in turn, the chance of additional damage. The Golf R also includes Volkswagen’s Intelligent Crash Response System that shuts off the fuel pump, unlocks the doors, and switches on the hazard lights if the car is involved in certain types of collisions where the airbags deploy. The Golf R with DCC and Navigation model comes standard with Adaptive Cruise Control (ACC), Forward Collision Warning and Autonomous Emergency Braking (Front Assist) Blind Spot Monitor with Rear Traffic Alert, front and rear Park Distance Control (Park Pilot), Lane Departure Warning (Lane Assist) and High Beam Control (Light Assist). 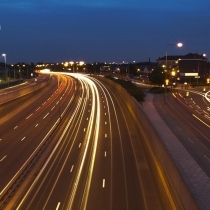 When the roadway ahead of the vehicle is clear, the system maintains the set speed. Golf R models fitted with DSG transmissions and ACC can match a vehicle in front and come to a stop, as well as automatically resume driving within a defined time period or if the driver chooses to do so. On manual transmission Golf R models, ACC will not operate below 19 mph. If there is an indication that the vehicle is unintentionally straying from its lane, the Lane Departure Warning system can actively countersteer to help keep the vehicle in the lane above 40 mph. The system’s camera recognizes visible lane markings (one side suffices) and, using a special algorithm, calculates the risk of the car leaving the lane. If the vehicle crosses a lane marking without use of a turn signal, the system countersteers and then provides an audible warning and a visual signal in the instrument cluster, asking the driver to take over. The system is designed to help alert drivers in specific situations; stationary objects or oncoming vehicles do not trigger warnings, nor will vehicles more than one lane away from the vehicle. Park Distance Control (Park Pilot) uses ultrasonic sensors located in the front and rear bumpers to monitor a range of up to five feet in front or behind the vehicle. The system is activated when reverse gear is engaged or below a speed of 9 mph and helps provide guidance when parking or in tight situations. The system has audible and visual warnings when the car starts to approach parked cars or static objects from the front or rear. All 2017 Golf R models are offered with Volkswagen’s standard five-year/60,000-mile (whichever occurs first) powertrain limited warranty and three-year/36,000-mile (whichever occurs first) new vehicle limited warranty.